They say good things come in small packages, and for me that means mini desserts. There is no way that I’m going to skip sweets, yet I don’t want a huge piece of pie or cake, either. The first few bites of any food are the most satisfying, so why eat more than you need? 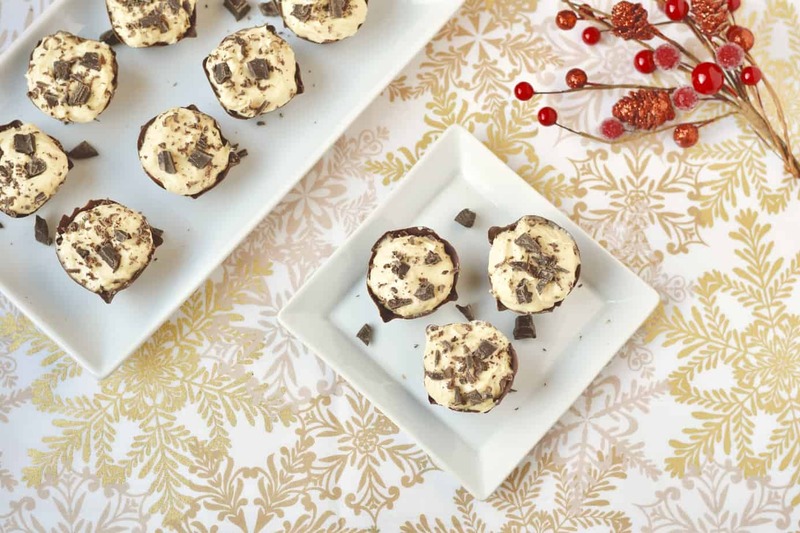 Here are three pint-size creations suitable for entertaining, and for every day! Preheat oven to 350°F. Coat a 24-cup mini-muffin pan with cooking spray. Place berries in small saucepan and cook for 5 to 10 minutes or until the fruit breaks down. Using the back of a wooden spoon, mash the berries. Take the berries off the heat. Add the sugar and chia seeds, and let the mixture stand until thickened. Place in the refrigerator until ready to use. Place the beans and the oil in a food processor. Process on high until smooth, about 2 to 3 minutes. Add the eggs, sugar, cocoa powder, and vanilla extract and blend well. Add the baking powder and salt and blend for 10 seconds more. Stir in the chocolate chips. Pour the batter by rounded tablespoons into each muffin cup. Bake for 10 minutes or until a toothpick inserted in the middle of a brownie bite comes out clean. Cool on a wire rack for 5 minutes, then remove from the pan and cool completely. Top each brownie with 1 teaspoon jam and a few coconut flakes. Place pumpkin, Greek yogurt, maple syrup, cinnamon, nutmeg, ginger, and cloves in a large mixing bowl. Beat on high speed for 1 minute. Set aside 3 tablespoons of the whipped topping or cream, and fold what remains into the pumpkin mixture. Spoon the mousse into 12 small serving dishes. Chill until ready to serve. Top each with a teaspoon of whipped topping and crumbled gingersnap cookies, if desired. Cut two clean, one-dozen empty foam egg cartons into separate egg cups to make 24 cups. Melt the dark chocolate. Place a heaping teaspoon of melted chocolate in each egg cup and tilt to evenly coat. Put egg cups on a baking sheet and freeze for 20 minutes. Place cream in a large mixing bowl. Beat on high speed until cream forms stiff peaks, about one or two minutes. Do not overbeat. Transfer cream to a medium bowl and set aside. Add cream cheese, sugar, and peanut butter to the large mixing bowl. Beat on high speed until smooth. Fold the whipped cream into the peanut butter mixture until completely combined and the mixture is uniform in color and texture. Refrigerate. Take egg cups out of the freezer. Carefully peel the egg carton from the chocolate, keeping your fingers near the bottom. To assemble, place a tablespoon or so of the peanut mixture into each chocolate cup and top with shaved chocolate.